One of the new architectural features of Princess Cruises' new Royal Princess is a "Sea Walk" promenade on the ship's top deck. The glass-enclosed walkway will give passengers dramatic sea views extending out 28 feet past the side of the ship. The drama doesn't end there, because the dramatic views will be both out to the horizon and down through the glass floor to the sea 128 feet below. 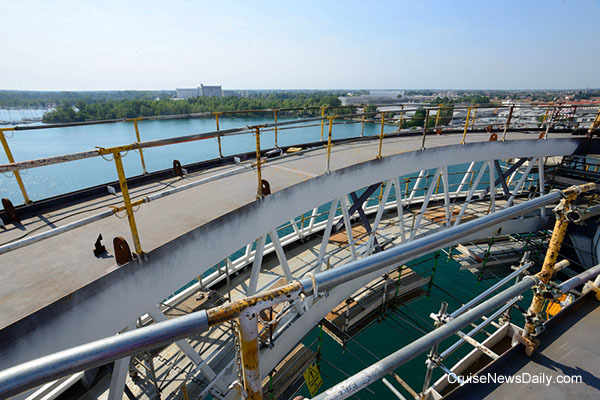 Royal Princess is under construction at Fincantieri's Monfalcone (Italy) yard, and these photos taken on Tuesday will give you a first look at the Sea Walk. In the photo above. 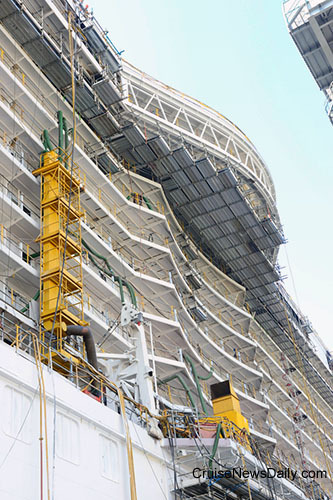 shot from Deck 17, you can see inside what will be the glass-enclosed Sea Walk on Deck 16. The openings where the glass panels will go in the floor are covered with metal plates. This view, still shot from Deck 17, looking forward, will give you a better perspective of the views that will be available from the Sea Walk. 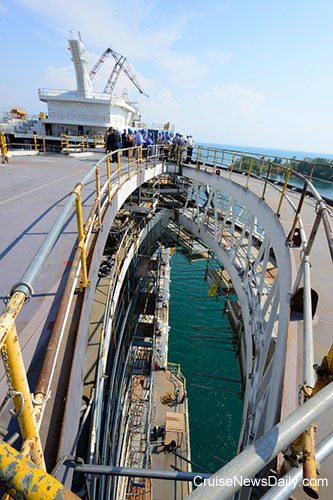 Seen from below, you get a perspective of how high the Sea Walk is - and how much work there is to complete on the ship before it enters service in June. A living wall was installed aboard Crystal Symphony. The freestanding wall is kind of like a vertical garden with the plants anchored in two to four inches of soil on the wall. In this case, the plants were arranged to form a map of the world. Photos courtesy of Crystal Cruises.